What about the maglev, good or bad? I think it is waste of money. Convesional high speed rail would have been much cheaper? I could be wrong. I don’t think the three items you mentioned are a failure, just like any government measures, with proper and consistant advertizing, it can become popular among people. It depends very much on how far the bureaucrat wish to persist. i wouldn’t call the push-for-green-light a failure as the authority only installed them at a few places to test its efficiency. it certainly makes no sense to install some at junctions near people’s square where there is always a huge army of pedestrians waiting to cross. also, in a city where people just start to learn to stop before red light, not much can be expected. as for the highways, i support using both names. the chinese names are not only indicative, but also beautiful. the A+n code will convenience the foreigners. taxi stops’ use shoud be pushed. it will gradually become popular,espcially if traffic police makes casual picking-up and dropping pay a heavy price. the maglev is or is not a failure is judged by if we can internalize the technology. not so much about money. the germans refused to share knowledge, which pissed us off. I’m at little confused as to why highway names needed to be changed to suit international visitors. In my two years in China, I never once saw a non-Chinese person driving a car (including in Beijing and Shanghai). My guess is that VERY few foreigners are driving on the mainland- so what is the need for non-Chinese road signs? It seems a waste of money to accomodate these very few, select people. 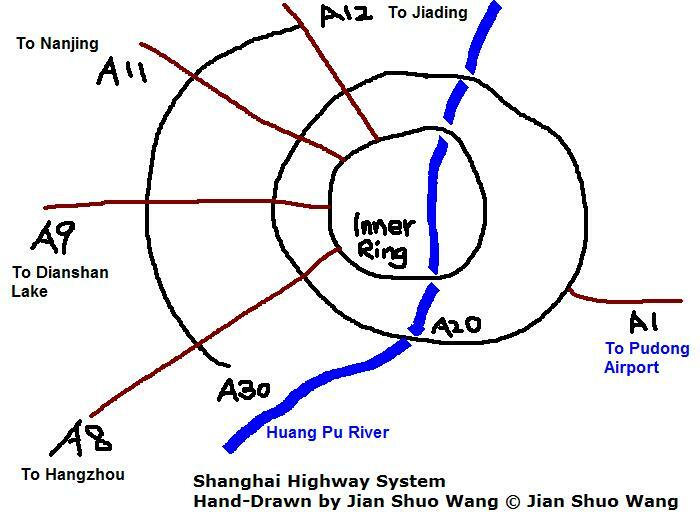 If a foreign resident of Shanghai is settled down enough to own a car and manages to nagivate Chinese roads (something I could not manage! :), then I don’t think it is too much to ask that they know enough Chinese to figure out road signs. My Chinese is pretty bad, but even I could read most highway signs looking out the window on bus trips. I also don’t think they are failures. Any new system needs time for introduction and, if necessary, improvement. Sometime people just have to learn and gradually become used to those new stuff. For example, they will soon understand that those push-for-green-light buttons in downtown may only work during those wee hours. If Shanghai wants to be a national city( all Chinese people’s city, not just Shanghai people’s city), and an international city, then new convenient name convention for all must be implemented. I like the city street and highway exit named with numbers, because numbers are self-sequency-indicated. For example, if I like to get off the highway to place A, I just need to know which high way exit number I need to take, for example, exit #20. Before approching exit #20, when I see exit #18, #19 (or #22, #21), then I know I am close to the destination exit, and prepare to exit the high way (like change lane, slow down, etc). The highway and city street in California is not named this way, which causes lots of trouble for people from other places. Many international cities have both numbered names and word names for thier major highways. Chicago is a good example. I’ve seen a few of those ‘press for green’ buttons and tried them. None worked. I’m so used to pressing those buttons at pedestrian crossings in my country that it feels strange not having to press that button here. Whenever I’m crossing the road, there’s always many other people who cross too. It is not good, not bad. It is a great toy for visitors. Very exciting, very efficient, but too costly. It is something that is useful enough. Stephen, I agree it is not the final failure. Lack of promotion is the major reason for it. But nothing can live without the surrounding support. So do these innovation. Patrick, I am not a government speakperson and I don’t know the real reason to change the names. Is it for foreigners or is it just a convinient way to make express ways stand out from other types of road (local road)? I am just guessing. JH, as I said, I am a strong supporter for these innovation, but the result is not good so far. The push-for-green buttons have been installed for two years. The A+n have been there for more than one year. I know they are very good for a modern city, but the time it takes are much longer than I have expected. Maybe the value will be observed after 5 years. Maybe I should not call it a failure. “Seldom Used Innovation” may be a better name. To all, I know it is sad that the innovation takes quite some time to get adopted. I am as frustrated and surprised to see it too. But it is the fact and this is an example to balance “good wishes” and the “real situation”. i think taxi stopps is a failure. we don’t need to use this. they are only like cartoon figures or mcdonald by the street. it’s a special report about china made by the guardian ulimited. Lot’s of articles about shanghai in every aspect of life. Compared to the 18 billion US dollars spent on the Big Dig (a 6 kilometer tunnel) in Boston, I DON’T think the Shanghai Maglev is a failure at all. The highway names are of course beautiful, but of no relevance for a guy from Yunnan or Liaoning; he knows nothing of the beautiful places and cities here, he only comes for the drive, not for a geographic excursion. The taxi stops are only meant for those who don’t know how to “wave” a taxi. All taxi drivers can see a “wave” in the most worse fog and dense traffic from approx. 200 m, so these stops seems to be a REAL failure. The meaning of taxis are to pick up and deliver at ANY place, so you are talking of making taxis into some public regulated minibus ? ? ? This is not the purpose of the taxis, Mr. Zhu. Regarding the Maglev, you are just so f…… arrogant ! You really scare me ! Don’t expect all the knowledge and technology to be free of charge, just because someone buy a superior engineered design from an outside country ! I see such a lot of s… made by “highly skilled workers, estimated engineers and university graduated scientists” here every day, so if the chinese COULD make their own Maglev, I certainly wouldn’t ride it ! As an example my country have lots of american F-16 fighters, and of course we know how they work, but we won’t steal the american company’s technology for that reason. I have myself made specialized parts to these planes before. If all “WE” (if you mean chinese) are “pissed off”, I have been SO wrong about the chinese people I meet in my work everyday. I’m here to share our technology to the chinese, but I will no longer do that, if you are representing the majority here. So be careful now ! Now China is a member of the WTO, so in time the requirements for a driving license will be in level with the rest of the world, ie. where a western driving license are a common proven guarantee for a skilled driver. So the naming are meant for the near future, don’t worry. Many of my long term stay collegues in China drives a car, and they are very happy for the improvements. Personally I think it’s insane to drive here. SO many jerks behind the wheels ! I have given up even bicyckling, as the chinese have no speed and respect, so I can go safer by any other transportation, exept taxis (unfortunately a necessary evil here). And Patrick, your chinese reading must be quite good to read the signs at 80-100 km/h ! But most foreigners don’t stay here for lifetime, and should not be required to waste time learning all city names in chinese in high speed, so please consider. I do not understand why foreigners shouldhave so much bureaucracy to drive a car here, my guess is that 99.8 of all western drivers are more skilful and careful in the traffic, so why go to a stupid test for this ?? I agree in your view ! and they put up these blue things with the button. The quality was just SO poor, after one week the rust (corrosion) on the button made it dark brown. In most countries these things are made of weatherproof materials, of course. After 2 weeks half the buttons was just gone, either bad design or vandalism. WHO bought these “life saving devices” ???? Shame on them ! But afterall it was some fun to get in behind he crowd and press the button (if working), and go along after 10-12 sec’s, when the other have waited 2 min’s ! I agree, LA is confusing ! In my european country we have destination names and road numbers on the main highway guiding signs. When an exit approaches (usually more than 1000m before), we have numbers on the signs, which is clear on every road map. The road itself have no name, only an E-number (for European highway). Smaller roads have numbers. Exits refers to cities, with km distance to them. I don’t agree with your first viewpoint. Numbering of Highway with A + Numbers is one popular way in the world, especially in Europe. But government can offer more free transport maps for the driver coming to shanghai in first time.